The plan to remake the Cambridge Street overpass is slated to include a new crosswalk and signal for pedestrian safety. Cambridge Street in Allston soon will get some new road stripes and long-anticipated bike lanes near Soldiers Field Road that should help allay community concerns about cyclist and pedestrian safety on the corridor. 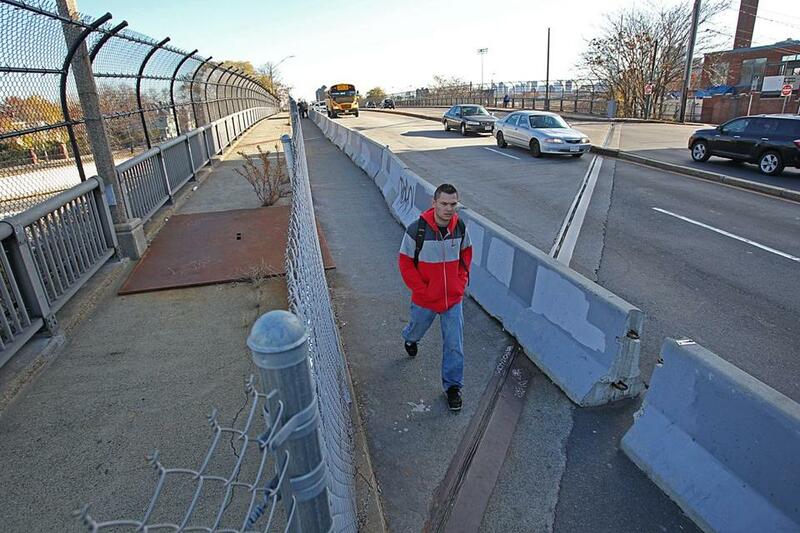 Boston Department of Transportation officials say they have plans to restripe the street in the coming month, adding bike lanes near the Cambridge Street overpass on both sides that will take away a car lane in each direction. The new lanes come just a few months after Allston residents rallied for a safer Cambridge Street, pointing out pedestrian and cyclist deaths that have occurred on the busy stretch near the Interstate 90 onramp. The new bike lanes are part of a plan to remake the Cambridge Street overpass, a two-year, $10 million project that is slated to include a new crosswalk and signal to improve pedestrian safety. Harry Mattison, an Allston resident who lives about 50 yards from Cambridge Street, praised the city’s transportation department and the Massachusetts Department of Transportation for making the bike lanes a priority. “There’s a huge pent-up demand for people that want to and should be able to walk and jog and cycle safely through this important corridor,” Mattison said. Officials say the removal of car lanes should help slow down traffic, which Mattison said is crucial to making the street safer. Officials will be tracking use of the bike lanes, which will run from Soldiers Field Road to Brighton Avenue. Some areas of the bike lane have already been put down closer to Union Square, and officials hope to replace the lanes with a cycle track in the spring. An Arlington reader recently wrote to ask why the Massachusetts Port Authority seemed to march to the beat of its own drum regarding parking fees for disabled drivers with special parking placards. Under state law, drivers of vehicles with disabled parking placards don’t have to feed most parking meters. But this reader said she has heard repeatedly that doesn’t include metered parking run by MassPort, which operates three airports, including Logan, and public terminals in the Port of Boston. The reader wanted to know why MassPort was an exception, so we asked MassPort and MassDOT. Spokesmen for both MassPort and MassDOT said the website was wrong. Matthew Brelis, a MassPort spokesman, said vehicles with disabled placards are not ticketed when meters are not paid. Brelis said his agency immediately asked MassDOT to remove the erroneous information from the RMV website. Michael Verseckes, a MassDOT spokesman, confirmed that the website had been corrected as of Friday afternoon. “We’ve removed the incorrect information and we apologize if this has caused any confusion,” Verseckes wrote in an e-mail. Nicole Dungca can be reached at nicole.dungca@globe.com.